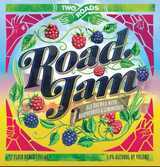 A wheat ale fermented with real red and black raspberries and accented with fresh lemongrass. It has a stunning red color and mouth-watering berry aroma. Fruity and refreshingly dry.